Thank you for your very kind letter, sorry for the long delay in replying. It is excellent what you have been doing. I am very happy to hear so far that you have been doing the preliminaries practices, this is so good. I am not sure if you have been doing the short or the long Calling the Guru From Afar prayer? If it is the long version, then this is very good, because it contains the entire lam-rim in it, as well as the tantra path. This is excellent to recite as it makes one’s life so worthwhile, so fortunate and this also is the foundation for developing devotion. It is very important if you can recite one lam-rim prayer each day, such as the Three Principles of the Path, Foundation of all Good Qualities, Calling the Guru from Afar (long one) etc. Also you can recite the lam-rim prayer that is contained at the end of your deity’s long sadana that contains all the stages of the common and tantric path. Each time you read it, it brings you closer to realizing the path and closer to enlightenment each day. So this means each day that you read one lam-rim prayer mindfully it brings you closer to liberating all sentient beings from the eons of samsara suffering and brings you closer to enlightening all sentient beings, which is the purpose of one’s life. In this life one needs to benefit sentient beings, to work for sentient beings. 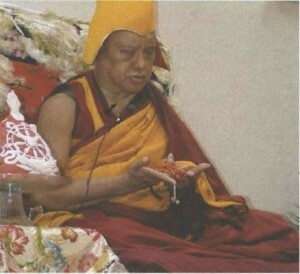 That is the real meaning of life, so for this one needs to practice Dharma, to achieve the path, to cease all the numberless sufferings and causes: karma and delusion, and the negative imprints and liberate all sentient beings from the oceans of sufferings in samsara and to enlighten them.